Pronounced “Skeen Do”. The words Sgian Dubh, also spelled Skean Dubh, literally translate to Black Knife (Sgian=Knife, Dubh=Black). The Sgian Dubh is a knife that is sheathed and worn in the top of Kilt Hose and measuring about 7 inches long including the handle. In days of old, you never knew when you might have to protect yourself, so the Highlander always kept his Sgian Dubh within his grasp. The Sgian Dubh should not be confused with the “ Scottish Dirk”. The Dirk is also sheathed, although much larger at about 18 inches long including the handle, and is worn on the belt. Both of these are for ornamentation, and usually made today with dull edges. This might also be a good time to say a few words about the Kilt Pin. 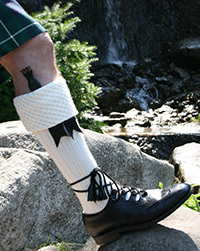 A Kilt Pin too is for ornamentation and is not functional. D0 NOT fasten the front outer apron of your kilt to the inner apron. This will be highly restrictive and likely damage your Kilt. The pin is only through the front apron. 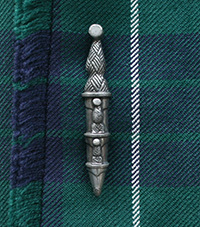 Kilt Pins come in a variety of designs and sizes, and can set off a Kilt nicely. So choose a Kilt Pin with class, and shy away from the old style safety pin.